Le VPN has teamed up with FlashRouters to offer a selection of the best VPN routers pre-configured with Le VPN service. 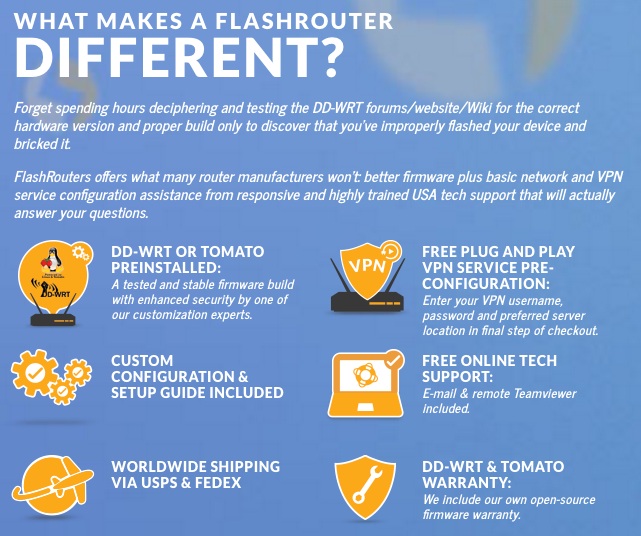 FlashRouters offer a vast selection of the most popular DD-WRT compatible routers that are “flashed” or upgraded with DD-WRT or Tomato firmware by the FlashRouters team. All their routers include technical support plans to help you setup the internet, the wireless connection and to integrate a VPN on your new router. Why use VPN routers for your home and office? Whether you want to access some streaming videos or music which are not available in your country, or get an extra security layer through a secure VPN tunnel, a VPN connection at the router level is necessary. Indeed, a VPN secures your internet access on all your devices, by encrypting your Internet connection directly on your Wi-Fi router. Using a VPN router configured with Le VPN allows you to change your IP address to 100+ countries and go beyond all geographical constraints. You are able to avoid censorship that prevails in some countries, unblock media content restricted in your country and make sure you can access all the websites, apps and social media that you want, whenever and wherever you want it. Indeed with a VPN router, there is no in-between and you can be sure that all your devices are secure and benefit from the high-speed and unlimited internet traffic with Le VPN. What are the key advantages of a built-in Le VPN connection on a router? A VPN router is a must have in the era of IoT (Internet of Things), and Le VPN on routers is indeed the best way to protect you and your family members, whatever device they use when they are surfing the web. A pre-configured Le VPN connection on your router is the ideal security solution for your smart home and office, and only one Le VPN plan will be enough to secure all your Wi-Fi enabled devices, including computers, gaming consoles, and smart TV. The great advantage of using a VPN on a router level is providing security to all your Wi-Fi enabled devices, even those that are not compatible with a VPN setup, like your smart fridge, smart lock or thermostat. Once Le VPN is enabled on your router, all the devices that connect to your router’s Wi-Fi stay secure. Learn more how to setup Le VPN on DD-WRT routers and make sure to visit FlashRouters if you are looking for a reliable and secure router!